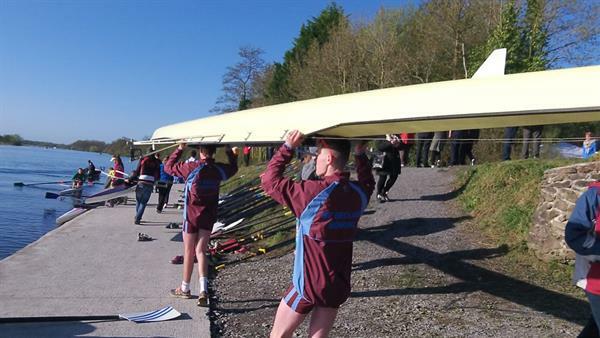 The St Declan’s rowing team which competed in the schools’ regatta in Limerick on Sunday 26 April 2015. It is the first time St Declan’s entered a team into this competition. We look forward to an even better performance from the lads in 2016. Rowing is unlike many other middle-distance events. Rowers must have a combination of both strength and endurance as unlike any other event races start with a sprint. This is a strategy no runner, swimmer or cyclist would consider for a race that lasts 2000 metres. Since rowers race with their backs to the finish line, the mental advantage of being ahead in the race (where you can see your competition but they can’t see you) is greater than the disadvantage of stressing the body so severely early in the race. If you get behind at the beginning of the race it can often be impossible to gain back what you lost, because anytime you attack the leaders they can see you coming. Therefore, virtually every crew rows the first 20-30 strokes at around forty four strokes a minute (flat out) before settling down to around thirty six strokes a minute for the main body of the race. As a result of this shock to the system, the rowers metabolism begins to function anaerobically within the first few seconds of the race. Basically the muscles begin to feed on themselves. This results in the production of lactic acid, which is a major source of pain. Marathon runners talk about hitting “the wall” around the 23 mile mark of a race. But rowers face that “wall” after roughly two minutes. The pain feels like needles are being driven into your thigh muscles, while your forearms seem to be splitting and your lungs and nostrils feel like they’re on fire. As you pass the 500 metre mark with another three quarters of the race left to go, you realise that you’re not going to make it to the finish but the idea of letting your teammates down by not rowing your hardest is unthinkable. Then it comes down to mental toughness and your ability to ignore the pain. On top of all of this rowers still have an all-out sprint in the last 300 metres or so. A grim prospect when they feel as if they’re about to pass out!